Make this recipe for over-the-top scrumptious Chocolate-Pecan Pie Bars! 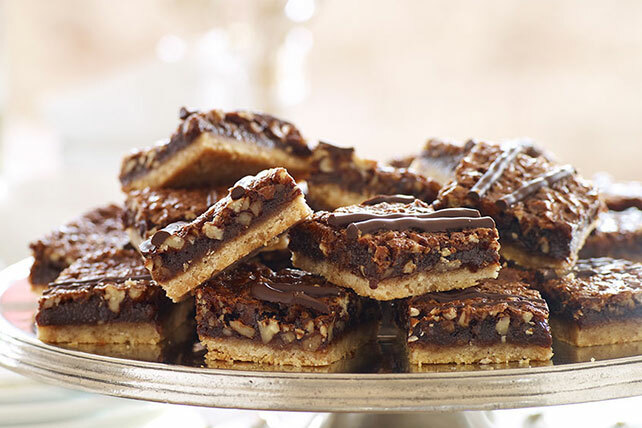 Serve and wow a whole crowd with these unbelievably tasty pecan pie bars. Meanwhile, microwave corn syrup and 6 oz. chocolate in large microwaveable bowl on HIGH 2-1/2 min. or until chocolate is almost melted, stirring after 1-1/2 min. ; stir until chocolate is completely melted and mixture is well blended. Add eggs, vanilla and remaining sugar; mix well. Stir in nuts. Pour chocolate mixture over warm crust; spread to evenly cover crust. Bake 35 min. or until filling is firm around edges but still slightly soft in center. Cool completely. Prepare and bake crust as directed. Cook corn syrup and chocolate in large saucepan on very low heat just until chocolate is melted, stirring constantly. Remove from heat. Continue as directed.